A couple weeks ago, I went to see Stewart Brand and Paul Saffo give a “salon talk” at the Interval (recap and audio of the talk here). It was a packed house – the talk had sold out in less than an hour, but I was lucky enough to be checking email when the tickets went on sale and bought one immediately, as these are two of my favorite thinkers. Stewart Brand is legendary for the Whole Earth Catalog, How Buildings Learn, the Long Now, etc. And I have been a fan of Paul Saffo since seeing him speak at Xerox PARC a decade ago. The topic of the night was Stewart Brand’s framework of pace layers – he posited that change happens in civilizations at different levels and at different speeds. Fashion is changing all the time, as people try new things – most fashion trends are fads that we forget, but some get absorbed into the culture. At the other end, nature is relatively slow-moving which is why it is difficult for us to create urgency around it (e.g. global warming). I was jotting down notes throughout the talk, especially quotes that were good soundbites, so I’ll share those below and annotate, but I also recommend reading the official recap. Brand: “Why do architects keep making, at higher expense, buildings that people detest?” He went on to note that over the lifetime of a building, only one third of the cost is in initial construction – the other two thirds is from doing remodeling and reskinning – he has a friend who realized this and started a company to do remodeling, which turns out to be more profitable than doing the initial construction. Brand: “Architects want to design buildings to stay the way they designed it. So they make it hard to change without tearing down the building” by putting the infrastructure of the building like pipes and electricity in hard-to-reach places. Instead of designing the building to be modifiable so it can adapt as needs change, architects want the building to remain true to their vision, even if it no longer suits the inhabitants of that building. I think there’s a deep concept here as designers, engineers and architects too often will prioritize their ego (in the form of their brilliant design at a point in time) over the needs of their users, which can change. Brand showed a great set of two photographs of San Francisco, one from the 1800s and one from today. And the street layout was the same, even though the buildings inhabiting those streets were much bigger. As he put it, “Huge skyscrapers have to dance to that choreography” (of the streets that already exist). Brand moved on to talk about the pace layers framework itself. Brand: “Fashion is about fashion – that’s why the curly line as it is about itself and is going back on itself.” Fashion is not for something – it is purely about experimentation and trying new things and commenting on itself. Brand: “There has to be slippage between layers.” Layers are not independent – what happens in one layer can affect others. So when a big event happens, it has impacts on multiple layers – Saffo later gave the example of the earthquake of 1906 in San Francisco (a surprisingly big change in the Nature layer) which led to the chance to remake the city (the Infrastructure layer) but also, because it cost so much to re-build SF, led to the Panic of 1907 (the Commerce layer). So big events reverberate at different timescales among the different layers, making causality sometimes difficult to track. Brand: “If you’re young or live in cities, you are focused on the quick stuff.” (Like fashion) Young people thrive on change and action, so they are focused more on the fast layers – I would posit this is why so many smart people go to Wall Street straight out of college, both for the Fashion layer of New York as well as the Commerce layer of Wall Street. Brand: “We are now at peak children.” I thought this was interesting – he says that as birth control gets more widely spread, and as societies become richer, they will have less children. We have been relatively successful at reducing infant mortality, which means more kids are surviving now than ever before, and soon culture will reflect that and people will start having fewer children. I don’t know if I believe it, but it’s an interesting idea. 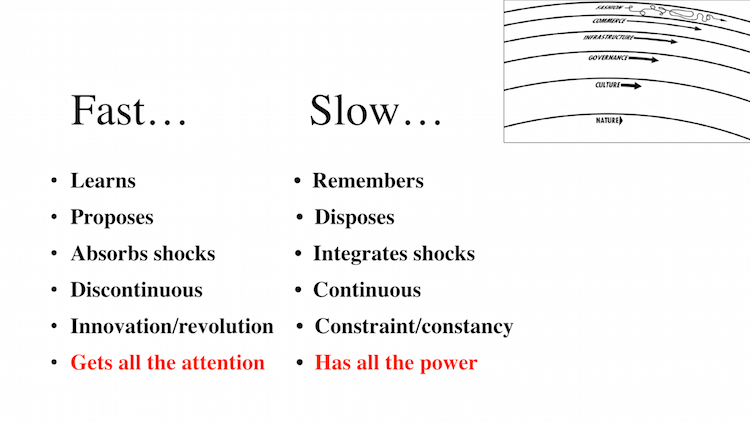 I liked this slide to summarize the difference between the fast and slow layers. It reminds me of my framework of learn and latch, where certain elements of society are off trying new things, and then the successful ones get built into society so that the next generation doesn’t have to re-learn the same things. If we were experimenting all the time, we’d never make progress, but if we only did what had been previously successful, we couldn’t adapt. It’s the balance between the two that has made humanity so successful. Brand: “The layers are a sifting device to figure out what matters to people.” He noted that hula hoops and jogging started in the same summer, but only one lasted. Fast layers are about trying lots of things, and seeing what sticks around. After Brand’s description of the pace layers concept, Paul Saffo came up to offer some thoughts. Saffo: “Slow layers catch up to fast layers.” He gave the example of the Internet innovating fast (in the Commerce and Infrastructure layers), but then starting to slow down now that Congress (the Governance layer) has caught up and is starting to get involved. He commented that this is why exponential growth decays into an s-curve. Saffo discussed the idea of “productive turbulence”. Not only is there slippage between layers, but there is friction and turbulence between layers. 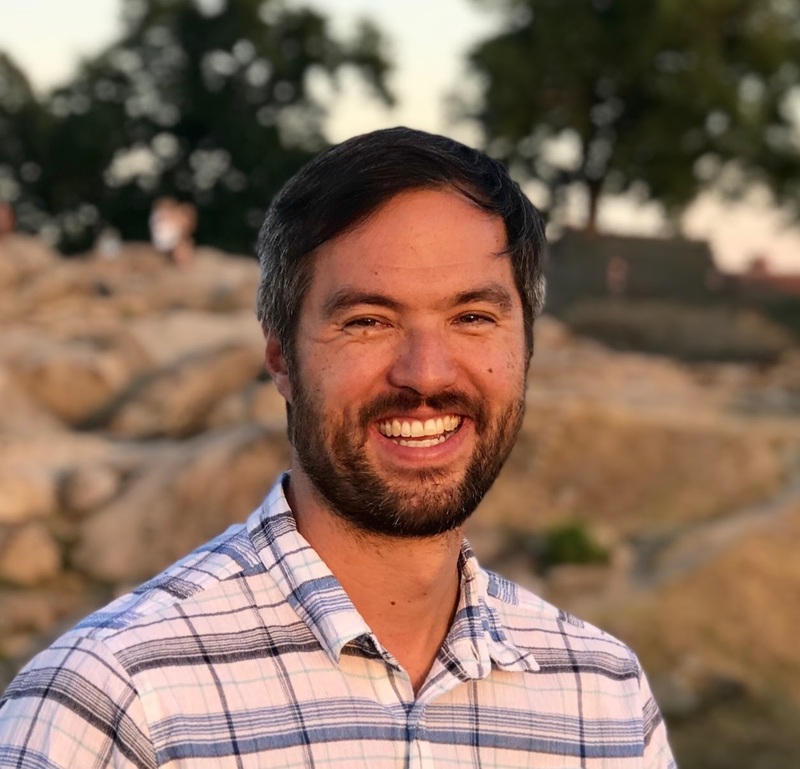 “The boundaries of pace layers are more interesting innovations and change than the layers themselves.” The boundaries are where we as a society decide what we value – these conflicts can sometimes take decades to work out. Saffo: “Think of silicon valley as a standing vortex.” He posits that Silicon Valley is an interface between layers, where fashion, commerce and infrastructure are all iterating fast, and then coming into conflict with the governance and culture of the US. He also noted that the San Andreas Fault lurking beneath our feet brings an awareness of instability even in the Nature layer. Saffo: “An early adopter is somebody who pays too much for something that doesn’t quite work yet.” He said that the government was the early adopter for the space race, which drove technology like digital computing. In response to a question of where the governance layer is responsive, Brand said it was at the city level, especially with regard to services like fixing potholes. In general, Brand believes that cities and city states are the future of governance, as they are at the right span of control to be effective for their constituents. But he also noted that we need a global government to manage problems like global warming. Saffo recommended the book “A General Theory of Bureaucracy”, by Elliott Jaques, as it describes the timespan of discretion, and whether decisions are made with regard to consequences of 20 minutes or centuries. 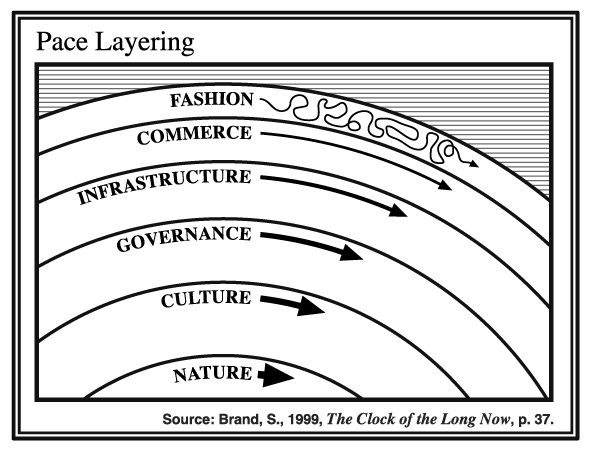 Somebody asked where technology fit into the pace layers framework, and Brand said that he originally had technology as its own layer, but eventually realized that technology was in all of the layers – it was a component of fashion, commerce, governance, infrastructure, etc. It was an enabler, not a layer in itself. He said that institutions are similar in cutting across layers. I can’t remember the question, but Brand noted that he thinks there is a values crisis in China (a crisis of the Culture layer). For decades, the Communist party was both governance and culture, but people now see that the party is outmoded, so they have flipped to the opposite extreme of prizing capitalism over all else. Everybody is pursuing wealth because they have nothing else to believe in. Commerce has taken over the Culture layer. Saffo at one point got on a rant about exponential literacy. We don’t have a good sense for power laws and how quickly things can blow up in exponentials (the example of the rice on the chessboard). But he also noted that there is “great folly and error” in too much belief in exponentials – the population bomb never detonated because other factors (other layers) smoothed out the exponential. He thinks the Singularity is “exponential horseshit” for the same reason. Interesting ideas. I think the pace layers framework can be helpful in thinking about how society changes. I’m not sure it makes much difference which layers one chooses to consider, as the essential idea to me is the friction between layers, where some elements of society are trying new things, and other elements are trying to preserve the way things are, and the conflict between them is where we decide (discover?) what we as a society value. Fun stuff – I’m glad I made the trek to the Marina for the talk. I also like someone wrote, I don’t remember who, about human motivation, emotion, control, and power. Like control and power, follow the money trail. Emotionally, as human, we have basically remain unchange (the exception being sociopath and psychopath). No example come mind on human motivation, but we all have them.